Join Dealspotr And Earn Rewards Today! When shopping we all want the best deal. Prices have skyrocketed lately making it harder and harder to stay on budget. 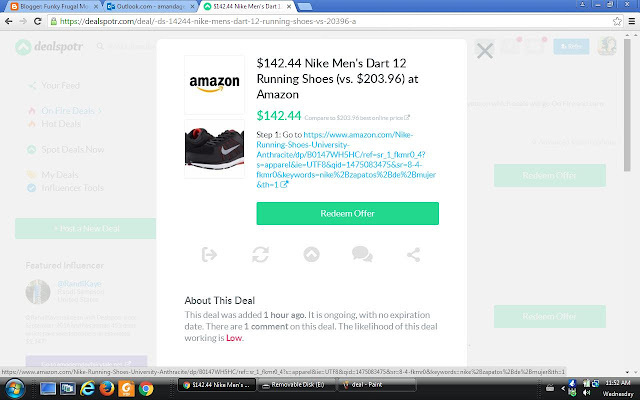 Dealspotr is the best site for finding the best deal on what your looking for. Not only will you get a great deal but you can earn gift cards to use on future purchases. Dealspotr is a new tech platform that connects influencers with shoppers and emerging brands in new and exciting ways. They enable real-time sharing of deals and expert product advice so shoppers can find the best product at the absolute best price. One of the most frustrating things about shopping online is when you get to the checkout and enter a coupon code only to find it is expired or invalid. At Dealspotr you never need to worry about that because the team of members is on top of each code verifying it is correct before you spend money or waste any time. Dealspotr is similar to cashback sites in that you're rewarded for participating, but unique in that you don't need to purchase anything to earn rewards. Dealspotr focuses on making posting deals quick and easy, while also making finding deals easier than on more traditional forums. Also, on Dealspotr members earn rewards for sharing deals. Dealspotr is the "Wikipedia of deals" - our content is crowdsourced, meaning our 30,000 members add, edit, and police all the deals on Dealspotr to ensure our deals are accurate and complete. We have the highest coverage and reliability of coupon codes in the industry. Due to our large and growing community, we have the best coverage of promo codes vs Retailmenot, Coupons.com, Groupon, or any other coupon site. We recently conducted an analysis of over 550 promo codes posted at major coupon sites to find the most reliable provider of codes. 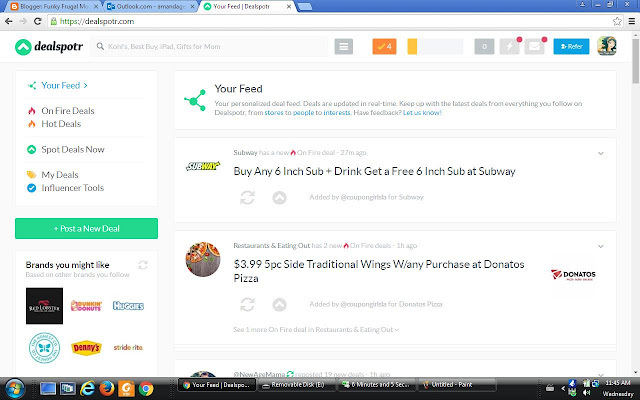 Dealspotr is the only deal site to give you your own personal feed of deals. Similar to your Facebook news feed, you can subscribe to specific brands, topics, and people and curate a daily feed of deals personalized for you. It's super easy to earn gift cards using Dealspotr, it's even reasonably easy to earn your first $10 gift card on your first day using Dealspotr. Plus, you're helping shoppers save money (and saving money yourself) while you're earning. The holidays are on the way and I know how important it is to save money around that special time of year. Imagine if you could save money shopping and end up being rewarded at the same time. This could create an amazing amount of spending money for us busy parents! Dealspotr can help you maintain your budget while getting the kids something special as well making this year fantastic! So not only are you getting a killer deal but if you share your findings elsewhere with the site you can earn rewards. So join today!